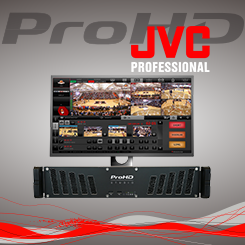 Put the power of an entire broadcast studio at your fingertips with the JVC ProHD Studio. With an abundance of features including: live switching, live streaming, ISO recording, custom CG templates and much more, make the JVC ProHD Studio a complete broadcast solution. Additionally, the JVC ProHD Studio fits nicely into any 2U rack space, and with its full-sized BNC connectors for SDI cameras, it is ready for your next broadcast. JVC is an industry leader in IP video acquisition and it shows, with the JVC ProHD Studio lineup. The ProHD Studio 4000 and 4000S feature NDI technology for sending and receiving low-latency HD video via a network. When connected to any IP-enabled JVC camera (including the award-winning Connected Cam), full CCU controls are available. Additionally, when combined with KY-PZ100 PTZ cameras, full PTZ control with presets, and group movements also are available. 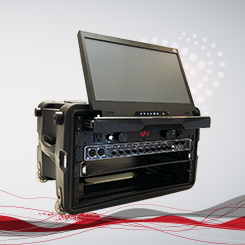 The JVC ProHD Studio fits into easily into a production truck. Similarly, it easily fits within a rack at a school or house of worship (HoW). With an intuitive touchscreen interface, simplified layout, and Zero Config (automatic setup) with JVC cameras. Consequently, the ability to create amazing broadcasts now is possible for anyone with any level of production experience. Even a volunteer or a novice producer can create and stream amazing content with ease. A better broadcast is a touch away. Designed for ease of use, the JVC ProHD Studio 4000 brings big features to a simple interface that anybody can operate. Live switching, streaming, and JVC camera control are easily accessed via a touchscreen interface. The ProHD Studio 4000 makes live video production easy and affordable. Slow motion, instant replay has never been easier. Based around a simple touchscreen interface, the JVC ProHD Studio 4000S is a real game changer. More than just instant replay, the ProHD Studio 4000S is a complete video production solution with NDI. Add it to your existing workflow or use it as its own all-in-one solution, the ProHD Studio 4000S is all you need for professional sports streaming. Take your ProHD Studio to any event, anywhere for live event broadcasts with ease. Housed in a rolling hard case, our “On the Go” (OtG) for ProHD Studio makes it easy and safe to transport your ProHD Studio directly to the action.The days of carrying a large fly pack or multiple cases now is over! We include all of the necessities to get the most out your ProHD Studio, including the monitor. For this reason alone, simply pair the OtG for ProHD with your ProHD Studio system (or send us your unit for professional integration), and enjoy the convenience of having a complete production solution that goes anywhere. Housed in a rolling hard case, our OtG for ProHD Studio makes it easy and safe to take your ProHD Studio directly to the action. The JVC ProHD Studio 4000 & 4000s (with instant replay) are available now at Stream Dudes, so please Contact Us to learn more and have us design a custom workflow.